Eugène Atget (French: [adʒɛ]; 12 February 1857 – 4 August 1927) was a French flâneur and a pioneer of documentary photography, noted for his determination to document all of the architecture and street scenes of Paris before their disappearance to modernization. Most of his photographs were first published by Berenice Abbott after his death. An inspiration for the surrealists and other artists, his genius was only recognized by a handful of young artists in the last two years of his life, and he did not live to see the wide acclaim his work would eventually receive. Atget moved to Paris in 1878. He failed the entrance exam for acting class but was admitted when he had a second try. Because he was drafted for military service he could attend class only part-time, and he was expelled from drama school. Still living in Paris, he became an actor with a travelling group, performing in the Paris suburbs and the provinces. He met actress Valentine Delafosse Compagnon, who became his companion until her death. He gave up acting because of an infection of his vocal cords in 1887, moved to the provinces and took up painting without success. His first photographs, of Amiens and Beauvais, date from 1888. In 1890, Atget moved back to Paris and became a professional photographer, supplying documents for artists: studies for painters, architects, and stage designers. Starting in 1898, institutions such as the Musée Carnavalet and the Bibliothèque historique de la ville de Paris bought his photographs. The latter commissioned him ca. 1906 to systematically photograph old buildings in Paris. In 1899 he moved to Montparnasse. While being a photographer Atget still also called himself an actor, giving lectures and readings. During World War I Eugène Atget temporarily stored his archives in his basement for safekeeping and almost completely gave up photography. Valentine's son Léon was killed at the front. In 1920–21, he sold thousands of his negatives to institutions. Financially independent, he took up photographing the parks of Versailles, Saint-Cloud and Sceaux and produced a series of photographs of prostitutes. Berenice Abbott, while working with Man Ray, visited Atget in 1925, bought some of his photographs, and tried to interest other artists in his work. She continued to promote Atget through various articles, exhibitions and books, and sold her Atget collection to the Museum of Modern Art in 1968. In 1926, Valentine died, and Man Ray published several of Atget's photographs in his La Révolution surréaliste. Abbott took Atget's portrait in 1927. Eugène Atget died 4 August 1927 in Paris. Atget took up photography in the late 1880s, around the time that photography was experiencing unprecedented expansion in both commercial and amateur fields. He sold photos of landscapes, flowers, and other pleasantries to other artists. 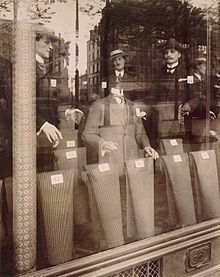 It was not until 1897 that Atget started a project he would continue for the rest of his life—his Old Paris collection. Atget photographed Paris with a large-format wooden bellows camera with a rapid rectilinear lens. The images were exposed and developed as 18x24cm glass dry plates. Between 1897 and 1927, Atget captured the old Paris in his pictures. His photographs show the city in its various facets: narrow lanes and courtyards in the historic city center with its old buildings, of which some were soon to be demolished, magnificent palaces from before World War II, bridges and quays on the banks of the Seine, and shops with their window displays. He photographed stairwells and architectural details on the façades and took pictures of the interiors of apartments. His interest also extended to the environs of Paris. In addition to architecture and the urban environment, he also photographed street-hawkers, small tradesmen, rag collectors and prostitutes, as well as fairs and popular amusements in the various districts. The outlying districts and peripheral areas, in which the poor and homeless sought shelter, also furnished him with pictorial subjects. Distinguishing characteristics of Atget's photography include a wispy, drawn-out sense of light due to his long exposures, a fairly wide view that suggested space and ambiance more than surface detail, and an intentionally limited range of scenes avoiding the bustling modern Paris that was often around the corner from the nostalgia-steeped nooks he preferred. The emptiness of most of his streets and the sometimes blurred figures in those with people are partly due to his already antiquated technique, including extended exposure times which required that many of his images be made in the early morning hours before pedestrians and traffic appeared. The mechanical vignetting often seen at some corners of his photographs is due to his having repositioned the lens relative to the plate on the camera—exploiting one of the features of bellows view cameras as a way to correct perspective and control the image. He often said, "I have done little justice to the Great City of Paris", as a comment on his career. Atget's photographs attracted the attention of artists such as Man Ray, André Derain, Henri Matisse and Picasso in the 1920s. Man Ray not only purchased a number of Atget's photographs but also used During the Eclipse for the cover of his surrealist magazine la Révolution surréaliste. When he asked Atget if he could use his photo, Atget said: "Don't put my name on it. These are simply documents I make." Man Ray said that Atget's pictures of staircases, doorways, ragpickers, and especially those with window reflections and mannequins, had a Dada or Surrealist quality about them. Man Ray was a neighbor of Atget—they lived on the same street—and offered to lend him his modern camera, but Atget refused the offer, preferring to use the older techniques. His death went largely unnoticed at the time outside the circle of curators who had bought his albums and kept them interred, mostly unseen. "This enormous artistic and documentary collection is now finished", he wrote of his life's work in 1920, though he did not stop working at this point. Atget created a tremendous photographic record of the look and feel of nineteenth-century Paris just as it was being dramatically transformed by modernization, and its buildings were being systematically demolished. Atget had published almost no work before "his genius was first recognized" by Man Ray and Berenice Abbott, two young American photographers working in Paris at the time. When Berenice Abbott reportedly asked him if the French appreciated his art, he responded, "No, only young foreigners." His discovery by Ray and Abbott happened around 1925, just two years before his death, and Berenice Abbott first published most of his work in the United States only after his death. She exhibited, printed and wrote about his work, as well as assembled a substantial archive of writings about his portfolio by herself and others. Abbott published Atget, Photographe de Paris in 1930, the first overview of his photographic oeuvre and the beginning of his international fame. She also published a book with prints she made from Atget's negatives: The World of Atget (1964). Berenice Abbott and Eugene Atget was published in 2002. After Atget's death in 1927, his remaining archive was split. 2000 negatives were donated to a Paris institute, with the remainder bought by Berenice Abbott with financial support by Julien Levy. In 1929, eleven of Atget's photographs were shown at the Film und Foto Werkbund exhibition in Stuttgart. The U.S. Library of Congress has some 20 prints made by Abbott in 1956. The Museum of Modern Art purchased the Abbott/Levy collection of Atget's work in 1968. In 1985, MoMA completed publication of a four-volume series of books based on its four successive exhibitions about Atget's life and work. Atget, a Retrospective was presented at the Bibliothèque Nationale of Paris in 2007. The Atget crater on the planet Mercury is named after him, as is Rue Eugène-Atget in the 13th arrondissement of Paris. Atget never said or wrote anything about his work, thus leaving no artistic statements. The U.S. Library of Congress was unable to determine the ownership of the twenty Atget photographs in its collection, thus suggesting that they are technically orphan works. Abbott clearly had a copyright on the selection and arrangement of his photographs in her books, which is now owned by Commerce Graphics. The Library also stated that the Museum of Modern Art, which owns the collection of Atget's negatives, reported that Atget had no heirs and that any rights on these works may have expired. This page is based on the Wikipedia article Eugène Atget; it is used under the Creative Commons Attribution-ShareAlike 3.0 Unported License (CC-BY-SA). You may redistribute it, verbatim or modified, providing that you comply with the terms of the CC-BY-SA.